I had the pleasure of interviewing Mollie Green, of La Familia Green. I really like Mollie’s style – it’s unique and sets her cards apart. I really love that they convey emotion, and tell a story with each design. You can find Mollie’s cards in the Pet category, or by searching “La Familia Green” on this site. I have always been an animal lover and grew up with pets. I became inspired to positively portray pit bulls and other rescue pets when I adopted my dog, Stickers, in 2008. My pet cards are some of my most popular – especially cats, people really love cats. 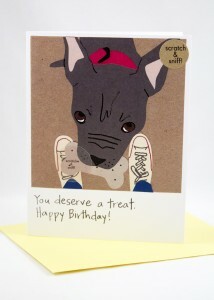 I get requests for breed-specific designs, but I try to mix it up – bully breeds, mutts and pure bred pups. I bring Stickers and my other dog Zuzu to work with me everyday (the cat stays at home). So they are literally a constant source of inspiration. Stickers is a better model than Zuzu. But Zuzu has an asymmetrical underbite that can’t be matched! And I enjoy connecting with people over pets. * What’s your favorite product or project? I love making cards. 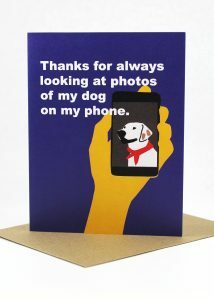 I have ventured out into other products and worked with big companies—but what I love most, is reaching my audience one greeting card at a time. * How do you give back (favorite charity project, environmentally conscious process, etc.)? La Familia Green supports small rescues and animal charities by donating some proceeds from sales as well as product (for auctions, goodie bags, etc) and design work. Around the Holidays, I use part of the sales to buy gifts for the homeless pets at the city pound. I am amazed by my friends that work tirelessly everyday for animal welfare. I’m glad I can help a little bit! * What did you do before launching your brand? After I graduated from art school, it took me a couple of years to find what I wanted to do. I worked at J Crew for many years. Madewell, which is owed by J Crew, started stocking my cards last year. It was awesome that things came full circle like that! * What’s your favorite color this season? I’m really into royal blue and white right now. I’m also incorporating gold foil – in my own little way. * What do you want people to know about your brand? Every design comes from my brain and hands. If you like my cards, then we would definitely be good friends.